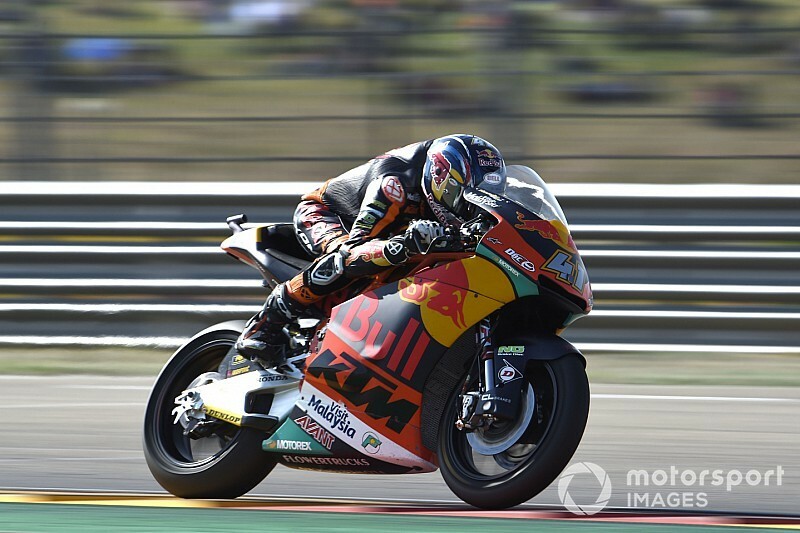 Ajo KTM rider Brad Binder took his second Moto2 win of the season at Aragon, as second-placed Francesco Bagnaia extended his points lead to 19 points. At the start, Binder led from pole but ran wide at Turn 16 at the end of the second lap, and surrendered first place to Alex Marquez. But Marquez was never able to pull away from Binder, and the duo was eventually joined by Bagnaia and then Pons rider Lorenzo Baldassarri. Binder started to put increasing pressure on Marquez but, after two unsuccessful attempts, he came close to crashing with Bagnaia as he ran wide at T16 again and the duo made contact on corner exit. Soon afterwards, Binder finally passed Marquez at Turn 12, and then quickly built a lead of a second. Bagnaia gave up third to Baldassarri after his near-crash, and the latter even challenged Marquez for second until he ran wide at Turn 3 and dropped back to fourth. The championship leader then passed Marquez at Turn 1 and finished second, 1.5s behind the victorious Binder. Baldassarri also outduelled Marquez, the duo trading places three times in a single lap, for the final spot on the podium. Marcel Schrotter (Intact GP) finished fifth ahead of MotoGP-bound riders Joan Mir (Marc VDS) and Miguel Oliveira (Ajo KTM). Having started 18th, Oliveira spent several laps in 10th behind Simone Corsi in the early stages, and eventually finished five positions behind his title rival Bagnaia, the gap between the duo increasing to 19 points. Mattia Pasini (Italtrans) was eighth ahead of Speed Up’s Fabio Quartararo and Gresini’s Jorge Navarro. Xavi Vierge was outside of the top 10 when he crashed at Turn 5, with Danny Kent and Stefano Manzi also falling during the race. Sam Lowes ran off-track while in 20th place, and only recovered to the very same position by the finish.